The feral pigeon is a descendant of the domestic homing pigeons introduced to Australia from European settlers. As a result, there has been an increase in feral pigeon numbers in many areas of Western Australia. Action needs to be taken to help rectify the feral pigeon problem before the problem escalates. They have a life span of 3 to 4 years in the wild and up to 16 years in captivity. Pigeons are monogamous. A mating pair will have 3 to 4 broods per year of 1 to 2 eggs each. Eggs are a solid white colour. They hatch in 18 days. The young leave the nest within 35 days. Pigeons do not migrate. They stay near their birth site (which may be your home). has a broad dark band across the end of the tail. Feral pigeons can also display white, brown or grey plumage. escalating costs through public liability insurance from slipping on dropping build up. Does your property have a pigeon problem? an accumulation of pigeon droppings on or around your property. Once you recognise your property has a pigeon problem you will need to take action to prevent pigeons from roosting and nesting on/in the building. If no action is taken the problem may escalate and more cost will be involved. In the majority of cases, if corrective action is taken, the property should be pigeon proofed indefinitely. Research has shown that only using lethal methods to control pigeons (culling) has its limitations as a long term control strategy. Implementing non-lethal control techniques is the most effective long term solution to reducing the pigeon population. Ensure that rubbish, especially from a food premises, is properly stored and food spillage is kept to a minimum. Pigeon nests are very simple and often consist of a few stiff twigs. Look for nests along building ledges, bridge supports, air-conditioning units, window sills etc. Pigeons are very persistent and destruction of the nest at regular intervals is needed with a combination of other control methods. It is important to prevent pigeons from gaining access to roosting and possible nesting sites by closing doorways and windows, and sealing open eaves etc. This may be as simple as closing a window or sealing a crack or crevice using materials such as mesh or wooden panels. Products such as netting (bird wire or mesh), wire coils or pigeon spikes prevent pigeons from landing or roosting on building surfaces. application of gel products that pigeons find sticky and uncomfortable to stand on. It will also be in the best interest for neighbouring properties to proof their property otherwise pigeons will quickly take up residence. This would move the problem rather than reduce the flock size. Lethal control techniques only ever achieve short-term reduction (in most cases only 4 to 6 weeks). The vacancies left by the removed pigeons can quickly be filled by juvenile birds. After a few weeks the flocks may reach their earlier size or are even larger than before. Examples of lethal control techniques are listed below. In many instances trapping does not have a long term effect on the pigeon population. The number of birds caught and killed during trapping operations can be replaced as quickly as the birds are removed. If the food source remains in situ the culling may act to increase pigeon numbers in a given area above the pre-cull number. If you decide to implement a trapping program to remove resident pigeons the source of food must be removed, otherwise the trapping exercise may be pointless. Licensed pest management technicians use a painless narcotic agent (Alpha-chloralose) which the birds eat and then go to sleep. The theory is the birds will be collected while they are asleep. They are then humanely despatched (removed). In some instances other birds which have accidentally consumed bait fly off after eating the food and this can lead to inhumane death. It is important that if this control option is used professional advice is sought. Again, you must remember to remove all sources of food otherwise the exercise may be pointless. Licensed pest management technicians kill pigeons with a firearm to reduce pigeon numbers. This method of control can be effective where pigeon numbers are low and other options of control are limited. Every situation will be assessed by the pest management technician to determine if shooting is a viable option. As with all the above control methods, killing adults may also leave juvenile flightless birds in nests to die of starvation. Proper precautions must be taken when tackling bird control projects, whether you are doing it yourself or if the work is undertaken by a licensed pest control operator. Respirators, goggles and protective clothing should be worn when cleaning bird sites, particularly those shaded with large amounts of droppings present. Please note: poorly designed or maintained pigeon proofing can lead to birds becoming fatally trapped. It is important for such products to be installed by a professional. For advice on feral pigeon control, contact your local environmental health officer (external site). 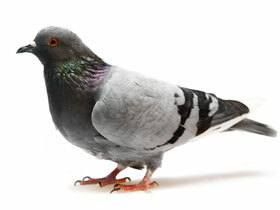 For the control of feral pigeons you may seek the services of a licensed pest management technician. The presence of pigeons can result in a range of problems. A combination of lethal and non-lethal control techniques is likely to be the most effective long term solution to reducing the pigeon population.